When an interior wall meets the curtain wall at a mullian the connection can be made as shown. To block the Flanking path through the mullian an additional layer of drywall or 1 b &a sheet metal can be added to each side. When an interior wall meets the curtain wall between mullions the wall should be jogged to meet the mullian. This thickens the appearance of the mullion as seen from the outside but provides much better isolation than stopping the wall short of the inner surface of the mullion. Where the end of the wall falls between two mullions the wall should be jogged over until it falls directly on the mullion. Occasionally there is a continuous air bar around the outside of the building that penetrates the dividing wall. 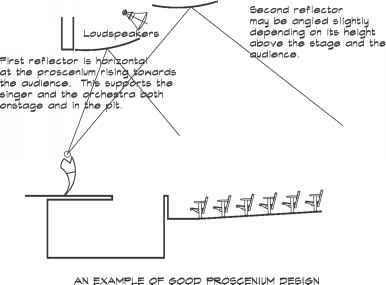 This can severely compromise acoustical isolation between spaces and must be closed off at the wall. Lined sections of duct can carry the air through the wall. Not infrequently in high-rise construction the exterior curtain walls are supported from the edge of the floor slab and a gap is left between the slab and the glazing. Where there is spandrel glass and an interior wall, it is a good idea to continue the wall up past the ceiling as shown in Fig. 16.26. 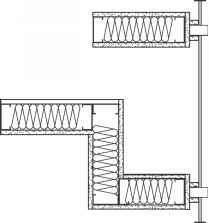 In other cases sheet-metal plates can be installed to bridge the gap between the slab and horizontal mullions both above and below the slab. The airspace should be filled with safing.